Apple has started running a fun new iPhone commercial focusing on the hands-free Hey Siri feature, as it’s being used by none other than Cookie Monster from Sesame Street fame. 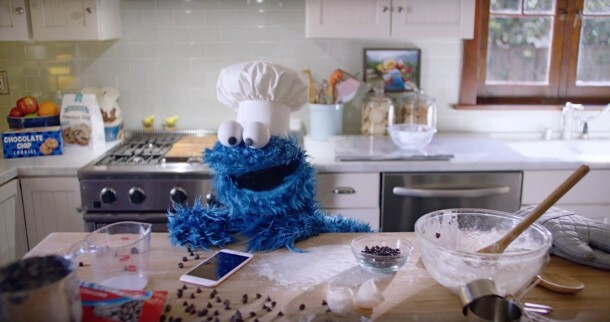 In the TV advertisement, Cookie Monster is making cookies (of course) and uses Hey Siri to set a timer on his iPhone 6S for the time it takes to bake the cookies. Cookie Monster again uses Hey Siri to start playing a music playlist featuring the song “Time in a Bottle” by Jim Croce, as Cookie Monster becomes increasingly impatient and fidgets around the kitchen, before using Hey Siri yet again to check the time remaining on the timer. This is a fun TV spot and it does a good job of keeping you entertained while showing off the features of iPhone and Hey Siri. It also reminded me of the “Me Want It (But Me Wait)” kids song by Cookie Monster from Sesame Street, a song about the importance of patience, self regulation, and waiting for things, perhaps like wanting cookies to bake faster, or like wanting an iPhone. That song, which has nothing to do with the Apple commercial aside from featuring cookies and Cookie Monster, is also embedded below, simply because if you’re already watching Cookie Monster videos and Jim Croce songs, why not watch another entertaining video? What do you think of the Cookie Monster iPhone commercial? Good? Great? Does it make you want cookies? Oh and by the way, if you’re going to cook with an iPhone or iPad, we recommend placing it in a zip locked bag to protect it from your kitchen ingredients while cooking and baking. Probably the best modern Apple commercial I have seen in some years, but maybe I just like Cookie Monster. By the way, Jim Henson was part of the Think Different ad campaign in the 1990’s. I saw that to. I wonder what it means. My phone was sitting on my desk as I played the spot. Siri heard Cookie Monster and started playing The Moody Blues on my phone! LOL, gotta love how Cookie Monster can activate Hey Siri in the rooms with the commercial playing! Hey at least you got Moody Blues, I hope it was “Wildest Dreams”, what a song. Reminds me of Coast to Coast bumper music, and that’s a good thing! As a final note, the phone’s timer went off 14 minutes after the commercial started. Love it. I can confirm Cookie Monster activates Hey Siri on my iPhone as well, it is next to my Mac and the commercial played, started a timer, then Siri started a playlist, also with Moody Blues, LOL. I never felt that Cookie Monster had the intellectual capacity to bake cookies. And where did he get the money for that nice kitchen and house? I don’t think this thing is real. Well. Put a childhood character on something and people just gush over it. That’s a great commercial. Great job Apple. I’m sitting on the couch tonight watching TV and my iPhone starts talking to me! Turns out there’s a new Cookie Monster commercial where he asks Siri to set the timer on his phone to bake some cookies and my phone answered. She said I’m sorry, Doug, I can’t set the timer but I can set the alarm. Would you like me to set the alarm? They’re taking over people, run!!!! I dont know what “Time in a Bottle” has anything to do with Apple or cookies or Sesame Street, but this is a great song and it caught my attention when I was in the other room. Don’t get the Easter egg.. Anyone explain? The number 6 and the letter S … iPhone 6s.